The inaugural Down the Tunnel tailgate is in the books and boy was it a good one. The drinks were flowing, grill was fired up and our friends at Indiana Whiskey were on site with some of their delicious whiskey for everyone to enjoy. I just wanted to thank everyone who came out and made it such an awesome event and even better weekend. The weekend was filled with meeting good people, good drinks, and good times. Special thanks to our friends at Indiana Whiskey for coming out and hanging out with all of us. There were rave reviews about their whiskey and I again encourage everyone to make sure they pick up a bottle (If you have not already) next time you are in the Indiana area. With the spring game over we are without football until the fall but it give us at Down the Tunnel to game plan some new ideas we are kicking around to improve our tailgates and the overall game day experience for our loyal Down the Tunnel readers. Again thanks to everyone who came out. It was great to meet you all. If you were not able to make it this weekend we look forward to meeting you next season. Its finally here. 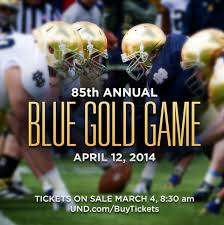 The 2014 football season begins this Saturday with the 85th Annual Blue Gold game. Its that time of year where the fan base is actually optimistic for a change. Well at least most of the fan base. There are always those outliers who always want to complain about something or another. But I digress. Saturday will be our first glimpse at the 2014 version of the Irish football squad. Now while the spring game is nothing more than a glorified scrimmage and we as fans are not going to see to much of anything in terms of scheme and the playbook, it is a good opportunity to see how some of the individual players have progressed through spring practice and to get an idea of who might be ready to contribute on the field this fall. And almost even more importantly, it will give anyone who is coming to town to watch the game a chance to come by the first ever Down the Tunnel Tailgate with our partners at Indiana Whiskey. So along with meeting good people and enjoying some great whiskey, here are some things to watch for on Saturday. Receiving corps- With Davaris Daniels suspended for the spring and TJ Jones and Troy Niklas headed to the NFL, the Irish receiving corps is going to look very different this spring than what we have grown accustomed to over the last couple years. While some of the young receivers did get playing time last season, Tommy Rees was the one throwing them the ball. In fact only one receiver who is on the roster for the spring game has actually caught a pass from Everett Golson; Chris Brown. While the amount of talent in the receiving corps is not argued, it will be interesting to see how the connection between Golson and receivers like Corey Robinson, Will Fuller, and Justin Brent will look after being away from the team for over a year. Everett Golson- Speaking of Golson, this will be the first opportunity for Irish fans to see him on the field since he was dismissed from the university last spring. During his time away, Golson worked with renowned quarterback guru George Whitfield and so far the reports out of practice paint Golson as a “Bigger, stronger, and faster” version than before. Yes it is just the spring game, but this will give everyone an opportunity to see how Golson has improved in his year away from the program. It’s good to finally have football back, if only for a short while. The Spring game is always a fun event that helps bring excitement to a new season of Notre Dame football. So if you are in town to attend the game, enjoy the great experience and make sure to stop by the Down the Tunnel tailgate. Indiana Whiskey will be there along with a lot of other delicious beverages, tasty foods, and good people. I have the final details and information for everyone tomorrow so stay tuned. Its going to be a fun weekend. If you are watching from home, just kick back have a drink and enjoy the first glimpse of 2014 Notre Dame Football. 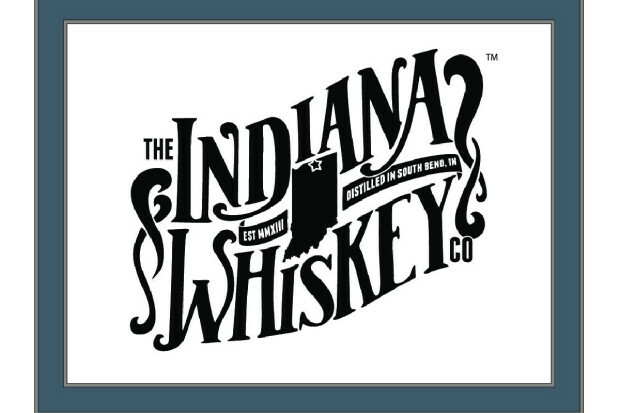 On behalf of the entire Down the Tunnel team, I am pleased to announce that we have reached a partnership/sponsorship agreement with the Indiana Whiskey Company based in South Bend, Indiana. The Indiana Whiskey Company is veteran owned and operated and produces truly excellent small batch whiskey. We could not be more excited in our new partner/sponsor joining the Down the Tunnel team. So what does this mean for you the reader? Well I am glad you asked. Very shortly (hopefully within the next day or so) you will see a tab at the top of the website that will take you directly to Indiana Whiskey’s website. Make sure you click on it and check them out. You will not be disappointed. Vise versa our new friends at Indiana Whiskey will have our site logo that you have come to know and love and a link to Down the Tunnel on their website. We both know that we share the same demographic; Irish fans and whiskey drinkers. In addition to this, the folks at Indiana Whiskey will be providing some of their delicious product for the Down the Tunnel Blue and Gold game tailgate that is taking place on April 12th and will also have a representative on site to talk about their company, answer any questions about their product, and to enjoy some whiskey with loyal Notre Dame fans. So if you are already planning on attending the spring game you have this awesome event to look forward to and if you are not planning on attending then it looks like you may have to rethink your decision. I mean come on guys its Notre Dame Football AND Whiskey. TOGETHER! What more could you ask for. On top of the spring game, our friends at Indiana Whiskey will also be providing their product for select Down the Tunnel tailgates during the football season (TBD which ones). As if enjoying game day at Notre Dame was not awesome enough, now you get to throw in drinking delicious whiskey with good people. Its a win-win for everybody. And once you taste this delicious whiskey, you will have no problem driving to the Indiana Whiskey Distillery to buy some to bring home with you. Its only 10 minutes from campus. Its a no brainer. You excited? I thought so. All of us are excited too. Now lets drink some whiskey! !